Military court finds Yazed Awad guilty of sheltering murderers and preparing them for Shin Bet interrogations. 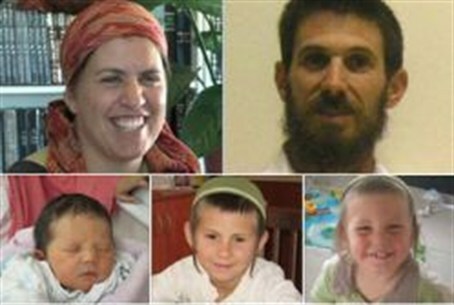 The Military Court in Shomron (Samaria) convicted Yazed Hassan Mohammed Awad on Sunday of assisting the murderers of five members of the Fogel family in Itamar on March 11, 2011. According to the charge sheet against him, Awad gave shelter to some of the people involved in the multiple murders and attempted to obstruct justice by briefing the suspects regarding Shin Bet interrogation techniques. In addition, he held two M-16 weapons that were stolen in the course of the murderous attack. The defendant denied the charges but in view of the evidence, the court decided unanimously to convict him. Knesset Speaker Reuven Rivlin lit Hanukkah candles with the surviving members of the Fogel family last week, at the Itamar yeshiva hall built in memory of the victims. "Eight candles were alight in the Fogel family menorah; we have remained with three burning candles and the light of the five candles that were putout on that terrible Friday night," Rivlin said. Murderers like the ones who carried out the massacre at Itamar are spurred to action by Palestinian Authority propaganda, yet Israel has not declared the PA an enemy or taken any punitive steps in response to the incitement.